Following the comparison of the latest global temperature data with the first IPCC predictions made 21 years ago in 1990 here, I received some valid criticism and suggestions. One in particular was that I should have used the latest report since advances in climate science have improved model predictions since 1990. I now need to admit that I was mistaken about the 2007 report, because in fact it does contain short to medium term predictions for global surface temperatures based on different CIESIN CO2 emission scenarios. Until 2025, the only scenario which differs significantly from the others is the one labelled “committed” where somehow the world is able to stabilise emissions at 2000 values. I have now overlaid the up to date HADCRUT & UAH data with smoothed trend fits on exactly the same prediction graph that appears in the 2007 report . You can check that the data overlay is precise since the black dots on the blue HADCrut curve are actually plotted on the 2007 IPCC graph and match exactly values I am using. The blue lines are HADCrut and the green line is UAH. Since 2000 there has been an apparent divergence of the data from the model predictions, and the data now lie below the “Commitment” curve which assumed that CO2 emissions were frozen at 2000 values. It was pointed out by John M Reynolds that in the HADCrut 160 year time series there is evidence for a 60 year temperature oscillation (see previous post) which he associates with a natural oscillation in the oceans. This would imply we could be entering a downturn cycle in temperatures for about another 30 years, overlaid over a long term warming trend due to increasing CO2 levels. Hi Clive. Nice work. I did a similar analysis back in 2007 then again in 2008 and haven’t bothered to repeat it. I like the fact that the IPCC graph shows how the projection trend line slopes were reduced from the first assessment report. I tried to point out for years that we are below the models projection even for the lowest ‘commitment’ trend line though we don’t qualify for that scenario as our emissions have been closer that that for A1B. My main issue was that the observed data was below the orange line before the AR4 report was published! And it wasn’t just myself who suggests that the ocean cycles are powerful enough to cancel out the CO2 warming of the past decade. There was a paper in Nature a couple years back that claimed that the lack of warming would last another 20 to 30 years before the warming returned. I think I first got the idea from Don Easterbrook. Hi John, Thanks for bringing to my attention the 60 year temperature cycle! I find it incredible that this is not properly discussed in various IPCC reports and elsewhere, as it sticks out like a sore thumb once you see it. I have been working for the last few days just on this in order to quantify this and best fit the data. The result is that the main component of the variation can be parameterised by a 0.1C harmonic oscillation, but there is still room for more than just one single frequency component. I think the cause of all this variation must have an astronomical origin, but there is no obvious 60 year cycle that I am aware of. The best hypothesis I can come up with is that the 11 year cycle of solar variability interferes with an 18.6 year tidal variation in the Oceans caused by precession of the lunar orbit plane. The superposition of both effects then results in the observed 60 day variation. See http://clivebest.com/blog/?p=2295 for details. Clive, thanks for your work putting this graphic together. It visually depicts what I’ve been telling folks for more than 5 years now. If you’d like to discuss solar physics, please feel free to write. I’m an expert in space radiation and plasma physics (coronal mass ejections, solar flares, etc.) as they impact the satellite electronics I’m responsible for at work. Your comments will stand the test of time, which is more than I can say for any of the IPCC Assessment Reports issued to date. A question: Am I correct in assuming that the bars on the right-hand side of the graph represent 95% confidence intervals? I think the bars represent the total spread of many different models each calculated for different CO2 emission scenarios. 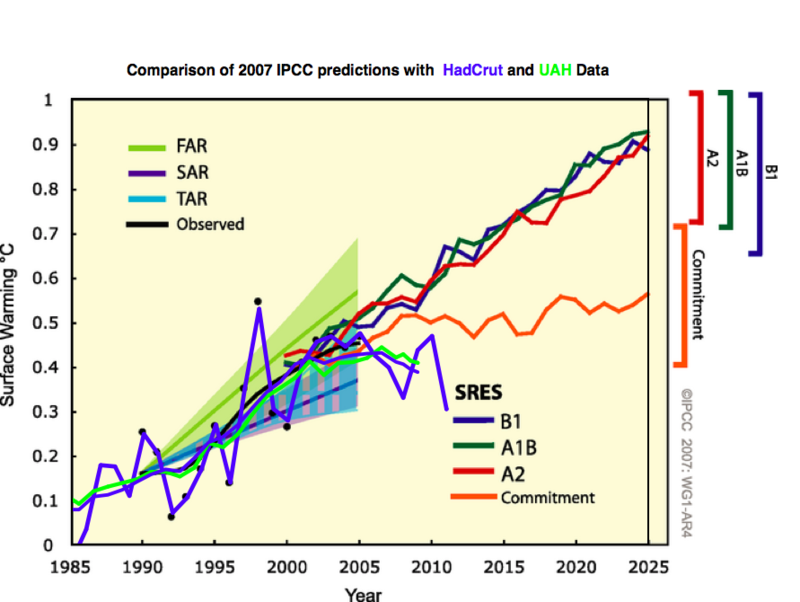 The graph is taken from the IPCC 2007 report. It predicts warming based on 4 scenarios for greenhouse gas emissions between 2005 and 2025. What I did was to take the latest temperature data and overlay them exactly on top of their predictions made in 2007. These are the green (UAH) and blue(HADCrut) lines. As you see the actual temperatures are well below predictions. Actual CO2 emissions have been similar to A1B. Pingback: ????????????? 2 « ? ?